Satellietgroep is uitgenodigd deel te nemen aan de 1e kunstenaarsintiatieven bijeenkomst in Istanbul in het kader van Istanbul Culturele Hoofdstad 2010, naar model van de Kunstvlaai in Amsterdam. De voorbereidende bijeenkomst is in oktober 2009 in Istanbul. Andries Micke zal namens Satellietgroep de voorbereidende presentatie op locatie verzorgen. Aanleiding voor deze uitnodiging is de deelname in september 2009 van Jacqueline Heerema namens Satellietgroep aan de werkreis voor kunstenaarsinitiatieven, georganiseerd door Stroom Den Haag naar Istanbul. 4. en het versterken van het culturele klimaat en het internationale karakter van Den Haag door deze uitwisseling te bevorderen. Istanbul 2010 European Capital of Culture Agency is organizing the 1st International Artist Initiatives Istanbul Meeting in cooperation with Art Pie as a parallel event of the 11th International Istanbul Biennial, between 02nd-06th October 2009 in Istanbul 2010 Art Production Center Kad?rga. It will include a fair, discussions and presentations. The general aim of the meeting is to create a communication platform among artist initiatives from various European and other countries for sharing information, experience and best practices and to enhance new cooperations on the way to Istanbul 2010 European Capital of Culture. As it is the parallel event of the 11th International Istanbul Biennial, the fair will also serve as a showcase for the participating artist initiatives in the international art scene. What is an “artist initiative?” Is there only one definition of it? Most of the artist initiatives claim to be “alternative”. What are they alternative to? What is their role in society and in the art world? These basic questions will be raised in order to lead to further questions to be discussed. Satellietgroep is an artists’ initiative created in 2006 in The Hague, The Netherlands for the purpose of studying the cultural significance of oceans and seas from the perspective of the arts and science. The group’s founders are Jacqueline Heerema (visual artist), Andries Micke (architect), Bas de Koning and Hederik van der Kolk (the graphic designers of creative collective Duel). We challenge artists, designers, (landscape) architects and scientists to develop new concepts and projects that articulate a cultural, innovative and sustainable significance of the sea and her coasts. The sea belongs to everyone and thus to no one – words that not only define the world’s largest public space but also leave it unarticulated. Oceans, seas and coastal regions are under tremendous pressure, worldwide. Faced with the prospect of global warming, economic and functional interests are competing for space. The changes anticipated are not only gargantuan but also geographically, ecologically, conceptually and philosophically unique. Shifting circumstances raise questions about new land, new (coastal) landscapes, new forms of urbanization and new offshore projects of various types. But the sea has a cultural significance as well. Its infinite space, timeless aura, tidal currents and empty horizon appeal to universal feelings of freedom and adventure. As our oceans stand on the threshold of great change, opportunities are emerging for new uses, different meanings and unprecedented approaches. This is the moment for a qualitative stimulus based on the development of specific characteristics of the sea from a cultural perspective. Artists, designers, architects and scientists are at the forefront of a different kind of thinking about – and a new way of experiencing – the qualities and problems of the sea. From nature to culture . . . and from concept to materiality. Arts and science can express the spatial and social qualities – as well as the problems – of our coastal areas, and make them surprisingly accessible to the public. It’s these works that transform a destination normally marked by consumption and recreation into a platform for serious communication. We aim at two goals: the first is inspiration: collecting and presenting works that articulate the cultural significance of the sea and coasts and encouraging artists and scientists to develop new concepts. The second is to try to influence city planners that this cultural approach should be part of urban coastal planning. Our aim is international: 70% of the globe is covered with sea; the subject is of importance for all. Our initiative is organized as a global network. 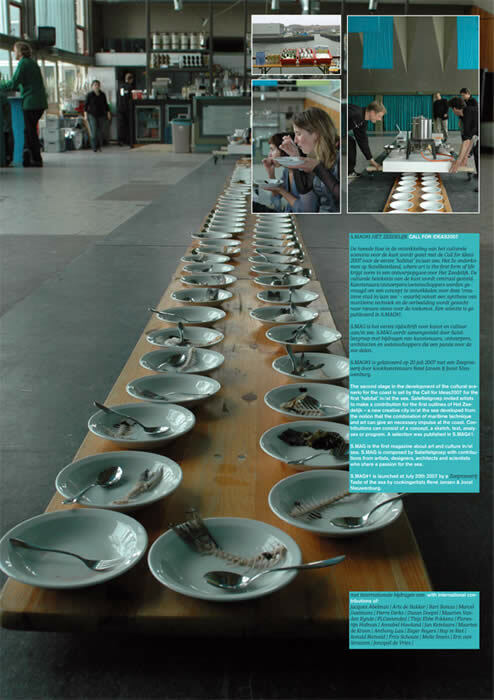 We work transdisciplinairy: we seek to combine arts and sciences in the researches of the cultural significance of the sea and the urban coastal developments. Our form follows concept: we do not deal with the concept of a 'white box' gallery, but for each project we create 'space' for concepts, projects and presentations. 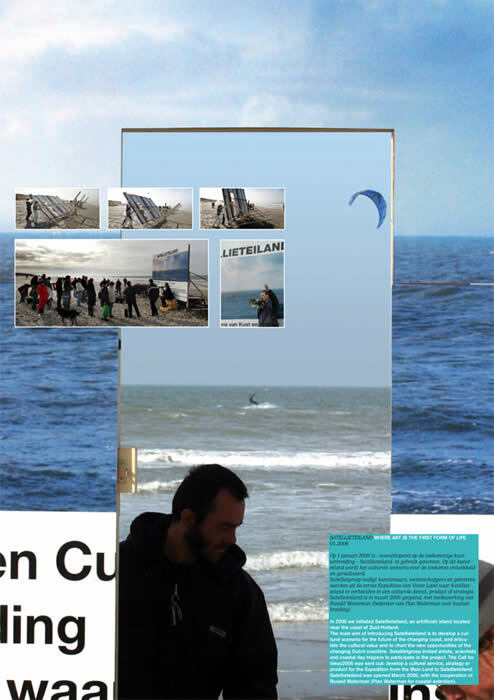 Satellietgroep’s projects include Satellieteiland, Zeedelijk, S.MAG (Sea Magazines), EXOOT, and BADGAST - artists in residency at the coast, all of which are aimed at securing a position for art and culture on seas and in coastal areas across the globe. 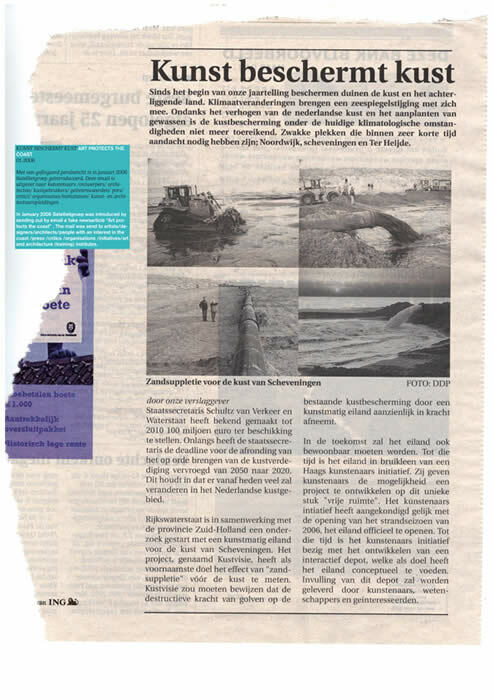 Article ‘Kunst beschermt kust’ (2006) In january 2006 Satellietgroep was lanched by posting a fake news article ‘Kust beschermt kust’ - Art protects the coast.’ The mail was send to artists, designers, architects, the press, critics, art and architecture (training) institutes. Satellieteiland (2006) In 2006 we initiated an art(ificial) island located near the coast of Zuid-Holland. The main aim of introducing Satellieteiland is to develop a cultural scenario for the future of the changing coasts in general and to chart the new opportunities of the changing Dutch coastline. 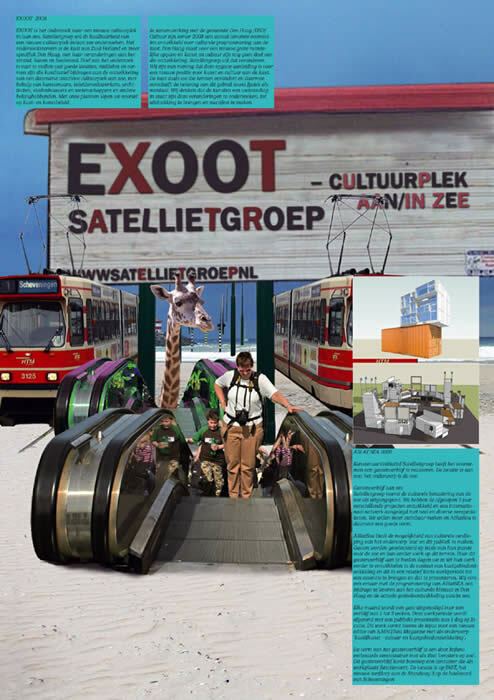 Satellietgroep invited artists and daytrippers to participate in developing a cultural product, strategy or service for the Expedition from the main land to Satellieteiland. Storm - crashtest for concepts (2006) During Storm 10 artists presented and exchanged in a conceptual crashtest their trail blazing proposals to load the space of Satellieteiland. We invited several experts to share their thoughts to illustrate and discuss the scope of these concepts. Icefishouse (2007) During the Day of Architecture 2007 we realized the most temporary sculpture with the melting Voorpost Zeedelijk – Icefishhouse on the beach of Scheveningen. S.MAG/Sea Magazine is a new magazine for art and culture in/on the sea. Satellietgroep composes S.MAG. 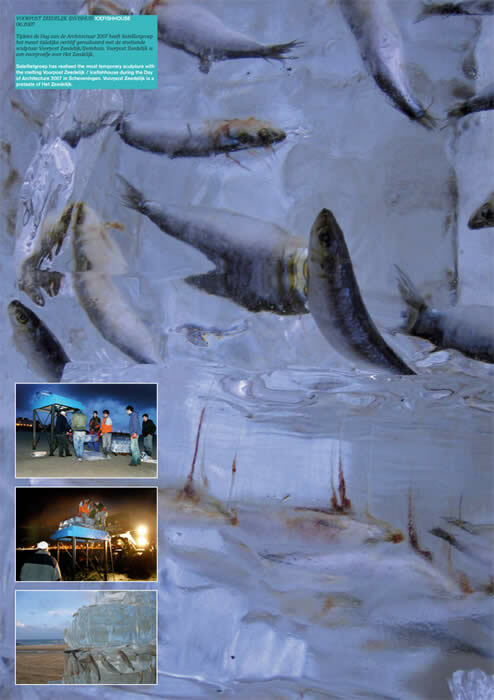 It publishes contributions of artists, designers, architects and scientists, all with a shared passion for the sea. S.MAG1 Het Zeedelijk (2007) For the second stage in the development of the cultural scenario of the coast we set out a Call for Ideas for the occupation of Satellieteiland. 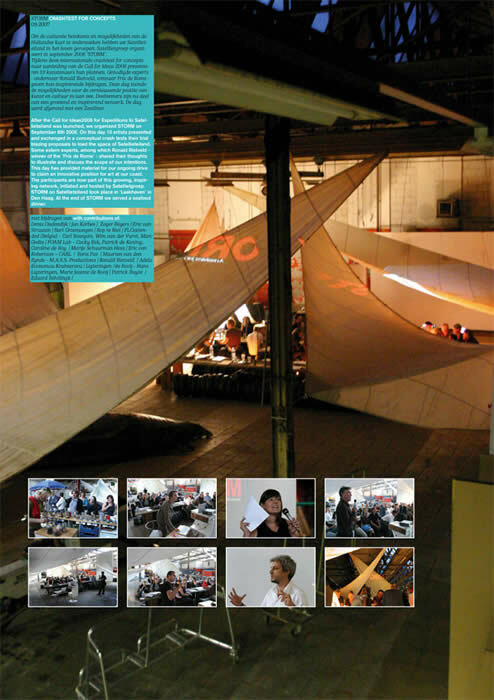 The Zeedelijk – a creative city in/at the sea - is developed from the notion that the combination of maritime technique and art can give a necessary impulse at the coast. A selection of 22 works was published in S.MAG1. S.MAG2 Geen zee/No Sea (2008) Thinking about the sea is thinking about what is. The sea is reality. Inextricably connected with earth, life, origin, food and oxygen. Opposing the presence is the absence. No sea. In reality this is impossible. Without sea, no water and therefore no life. At least, not the life we know. But the absence of the sea is conceivable. As a concept. As an idea. Opposing the reality is the possibility. 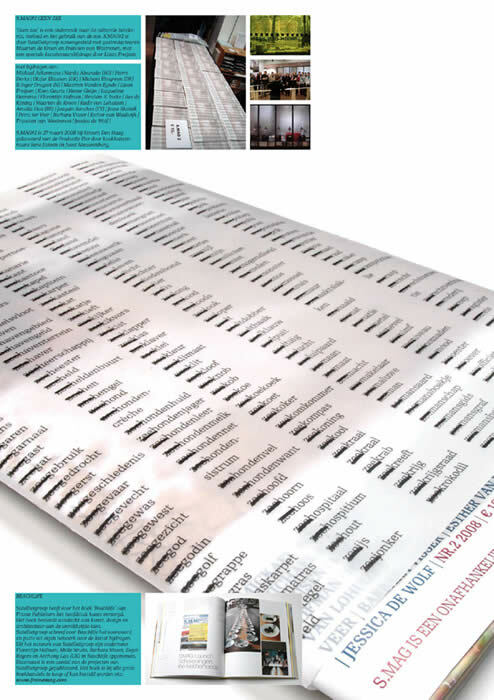 27 contributions of artists and scientist are presented in S.MAG2. 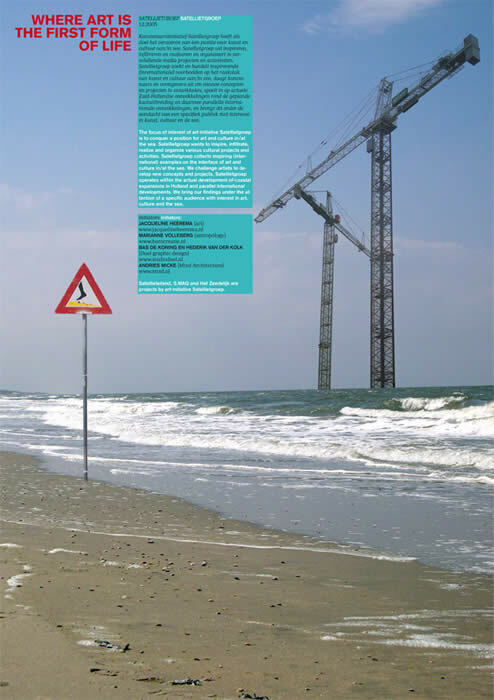 BEACHLIFE (2008) Satellietgroep wrote the introduction and art chapter for the book 'Beachlife' by Frame Publishers. The book focuses on art, design and architecture on worldwide coasts. 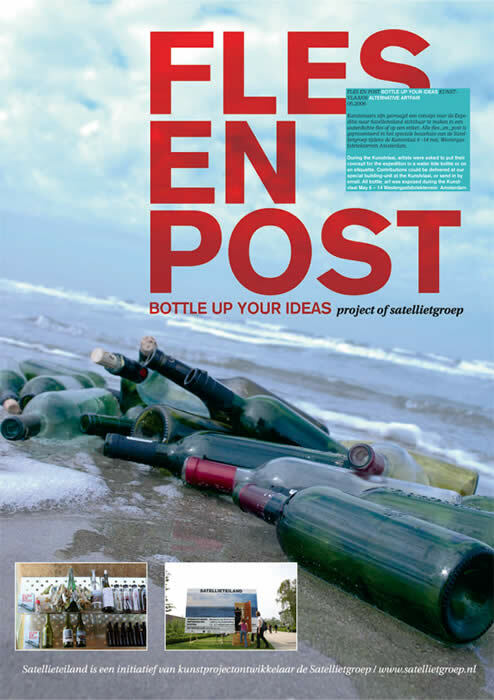 For the ‘art’ chapter Satellietgroep digged in its own network and contributed generous from it. EXOOT (2008) In this third stage of the cultural development of the sea and coast Satellietgroep started a research to determine the feasibility of a new place for culture in/near the sea. Focus of our research is the coast of Zuid Holland (The Netherlands) and to be more specific: The Hague, a city that faces great changes on her coast, beach, harbor and boulevard. Satellietgroep has built an artists residency! It is located at the seaside. The subject of research is the sea. BADGAST offers the possibility of deepening the cultural perspective on the subjects ‘sea’ and coast. And makes its results public. Guests are selected on the basis of their passion for the sea and the significance of their earlier work in this field. By offering this residency we challenge our guests to develop their work in the context of greater coastal area developments in a relative short period and we ask them to bring it to an essential stage for presentation. 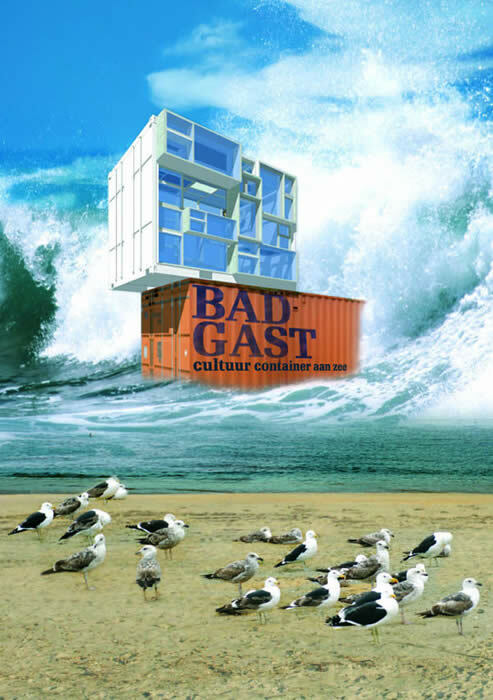 BADGAST is situated at FAST, the new urban beach community that is created at the spot where the boulevard turns into the harbor of Scheveningen, The Hague.